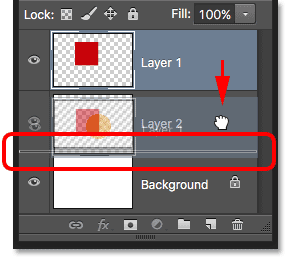 Learn the basics of layers in Photoshop, including what layers are, how they work, and why knowing how to use layers is so important. For Photoshop CC, CS6 and earlier versions of Photoshop. If you're brand new to layers in Photoshop, you've picked a great place to start. For this first look at layers, we'll focus on what layers are and why we need them. Rather than creating anything fancy, we'll use some very simple tools to draw some very simple shapes. Then, we'll learn how we can manipulate those shapes within our document using layers! We'll start by creating our composition without layers and looking at the challenges we face when trying to make even simple changes. Then, we'll create the same composition again, this time using layers, to see just how much of a difference layers really make. The basics of layers have not changed at all over the years, so even though I'll be using Photoshop CS6 here, everything is fully compatible with Photoshop CC as well as earlier versions of Photoshop. So, if you're ready to learn about layers, let's get started! Layers are, without a doubt, the single most important aspect of Photoshop. Nothing worth doing in Photoshop can, or at least should, be done without layers. 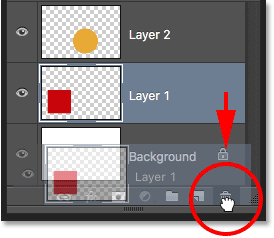 They're so important that they have their own Layers panel as well as their own Layer category in Photoshop's Menu Bar along the top of the screen. You can add layers, delete layers, name and rename layers, group them, move them, mask them, blend them together, add effects to layers, change their opacity, and more! Need to add some text to your layout? It will appear on its own Type layer. How about vector shapes? They'll appear on separate Shape layers. Layers are the heart and soul of Photoshop. It's a good thing, then, that layers are so easy to use, and easy to understand, at least once you wrap your head around them. "That's great! ", you say, "but that doesn't tell me what layers are". Good point, so let's find out! 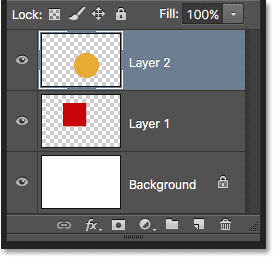 This tutorial is Part 1 of our Photoshop Layers Learning Guide. 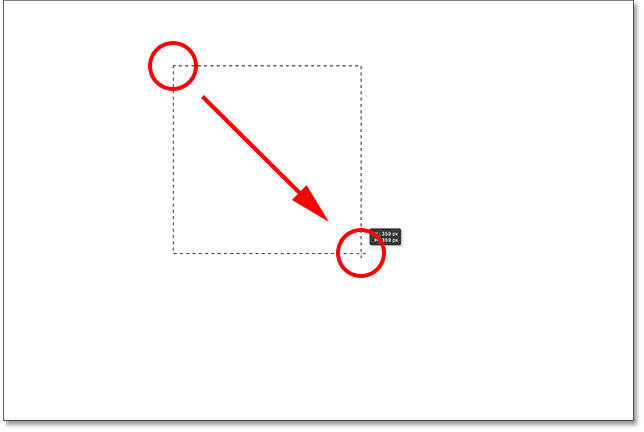 To draw a square with the Rectangular Marquee Tool, click anywhere in the upper left of your document to set the starting point for the selection. Then, with your mouse button still held down, press and hold your Shift key and drag diagonally towards the lower right. Normally, the Rectangular Marquee Tool draws freeform rectangular selections, but by pressing and holding the Shift key, we tell Photoshop to force the shape of the selection into a perfect square. 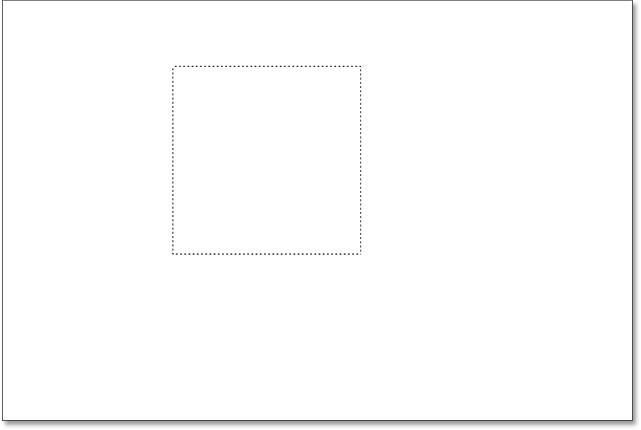 Drawing a square selection with the Rectangular Marquee Tool. 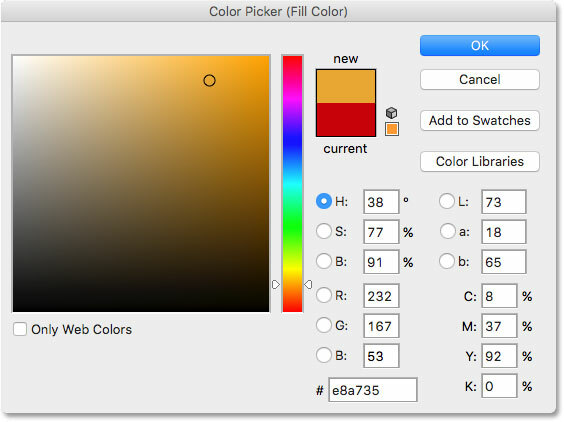 Choose a color from the Color Picker. Any color will do. The document after filling the selection with red. So far so good. Now let's add a second shape to the document. We've already added a square, so let's mix things up a bit and add a round shape this time. 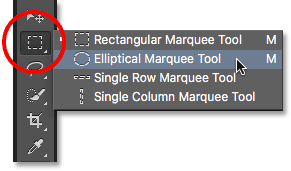 For that, we'll use another one of Photoshop's basic selection tools—the Elliptical Marquee Tool. Let's draw our round shape so that it overlaps the square. Click in the bottom right corner of the square to set the starting point for the selection. Then, with your mouse button still held down, press and hold Shift+Alt (Win) / Shift+Option (Mac) on your keyboard and drag away from the starting point. Normally, the Elliptical Marquee Tool draws freeform elliptical selections, but by holding down the Shift key as we drag, we force the shape into a perfect circle. Holding the Alt (Win) / Option (Mac) key tells Photoshop to draw the shape outward from the point where we initially clicked. 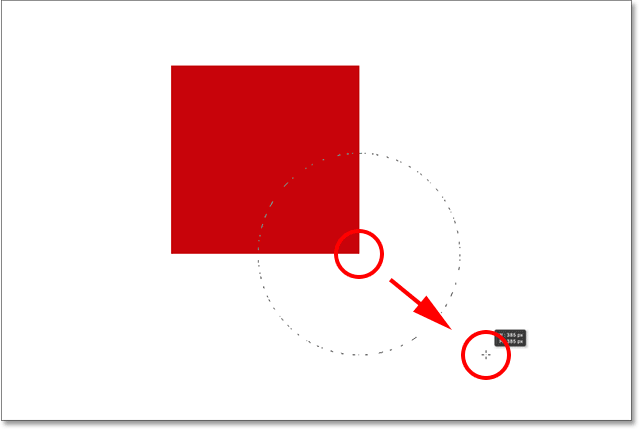 Drawing a circular selection that overlaps the square. Once you've drawn your circular selection outline, go back up to the Edit menu at the top of the screen and choose Fill to fill the selection with a color. The Use option at the top of the Fill dialog box should already be set to Color since that's what we set it to previously. But if you simply click OK to close out of the dialog box, Photoshop will fill the selection with the same color you chose last time, and that's not what we want. Choose a different color for the second shape. The document with both shapes added. Now that I've been looking at it for a while, I'm not sure I'm happy with something. See how the orange shape overlaps the red one? I know I did that on purpose, but now I'm thinking it was a mistake. 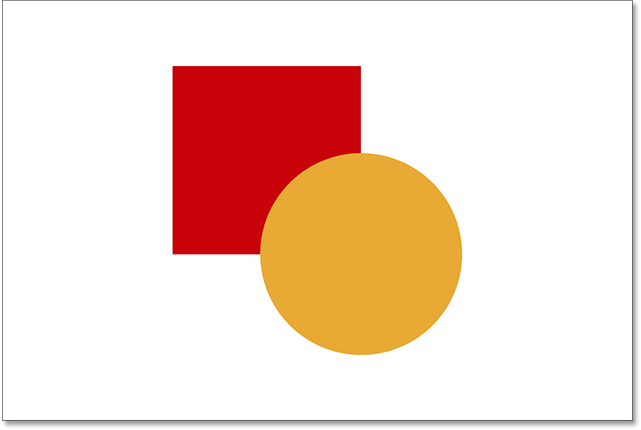 It might look better if the red shape was in front of the orange shape. I think I want to swap them. That should be easy enough, right? All I need to do is grab the red one and move it overtop of the orange one. To do that, we... um... hmm. Wait a minute, how do we do that? I drew the red one, then I drew the orange one, and now I just need to move the red one in front of the orange one. Sounds easy enough, but... how? The simple answer is, I can't. There's no way to move that red shape in front of the orange one because the orange one isn't really in front of the red one at all. It's just an illusion. 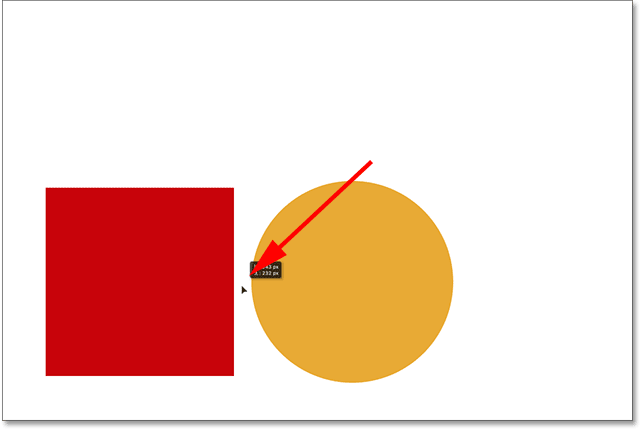 The orange shape is simply cutting into the red one, and those pixels that were initially colored with red when I filled in the square were changed to orange when I filled in the circle. 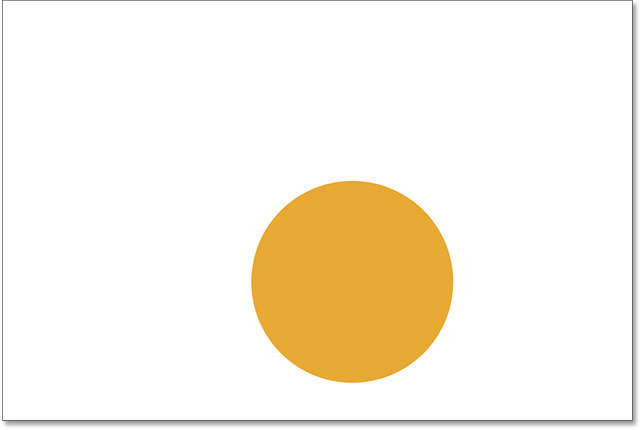 In fact, the two shapes are not really sitting in front of the white background, either. Again, it's just an illusion. The entire composition is nothing more than a single flat image. 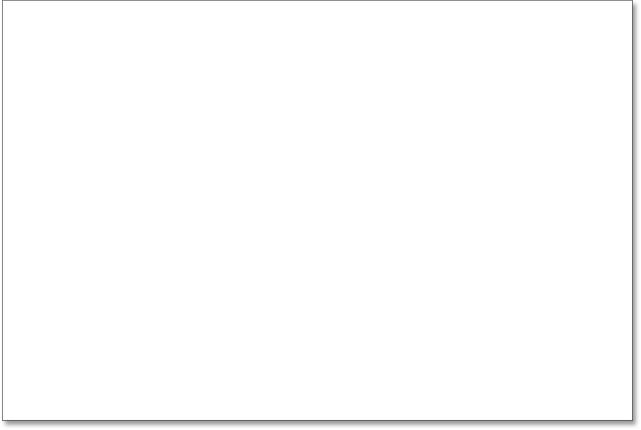 Everything in the document—the square shape, the round shape and the white background—is stuck together. 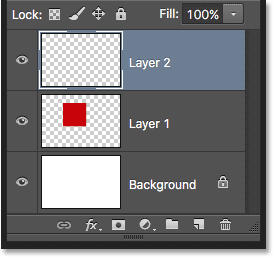 Let's take a look in our Layers panel to see what's happening. The Layers panel is where we view the layers in our document. 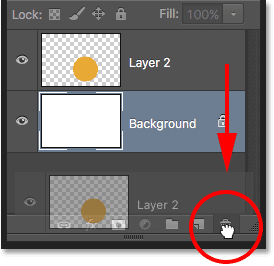 Notice that even though we haven't looked at layers yet, and made no attempt to add one ourselves, Photoshop automatically created a default layer for us. 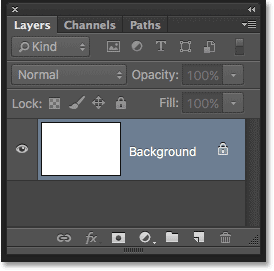 The default layer is named Background because it serves as the background for our composition. 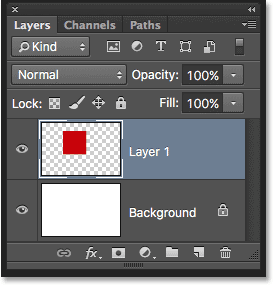 The Layers panel showing everything on the Background layer. And that's the problem. Everything we did was added to that one layer. With our entire composition on a single layer, we don't have many options if we want to change something. We could undo our way back through the steps to get to the point where we can make our change, or we could scrap the whole thing and start over again. Neither of those options sounds very appealing. There must be a better way to work in Photoshop, one that will give us the freedom and flexibility to change our composition without needing to undo a bunch of steps or start over from scratch. Fortunately, there is! The solution is to use layers. Let's try the same thing, but this time using layers! Now that we've seen what it's like to work in Photoshop without layers, let's see what layers can do for us. First, we'll clear away the two shapes we've added. Since everything is on a single layer, we can do that easily just by filling the layer with white. Going to Edit > Fill, then changing Use to White. The document is once again filled with white. I mentioned a moment ago that the Layers panel is where we go to view the layers in our document. But really, the Layers panel is so much more. In fact, it's really Command Central for layers. 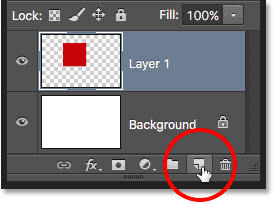 If there's something we need to do in Photoshop that has something to do with layers, the Layers panel is where we do it. We use the Layers panel to create new layers, delete existing layers, rename layers, move layers around, turn layers on and off in the document, add layer masks and layer effects.... the list goes on. And it's all done from within the Layers panel. 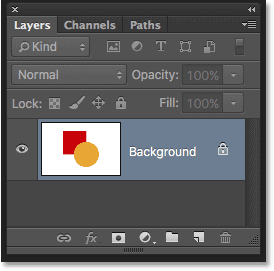 The Layers panel showing the white-filled Background layer. When we initially added our two shapes to the document, they were both added to the Background layer, and that's why there was no way to move them independently of each other. The shapes and the white background were all stuck together on a flat image. This way of working in Photoshop, where everything is added to a single layer, is known in technical terms as "wrong" because when you need to go back and make changes, you run into a "problem" (another technical term). Let's see what happens if we create the same layout as before, but this time, we'll place everything on its own layer. 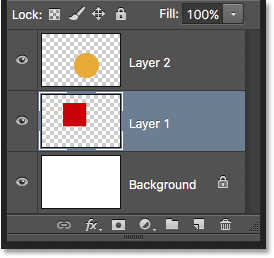 A new blank layer named "Layer 1" appears above the Background layer. Notice that Layer 1 is highlighted in blue. This means it's currently the active layer. Anything we add to the document at this point will be added to the active layer (Layer 1), not the Background layer below it. Let's add our first shape, just as we did before. Since our first shape was the square, we'll need to once again select the Rectangular Marquee Tool from the Tools panel. Selecting the Rectangular Marquee Tool from behind the Elliptical Marquee Tool. Go up to the Edit menu at the top of the screen and choose Fill. 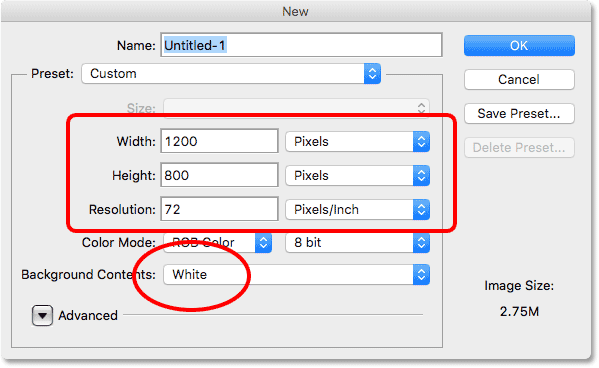 When the Fill dialog box opens, change the Use option to Color, then pick a color for the square from the Color Picker. I'll choose the same red color I chose last time. 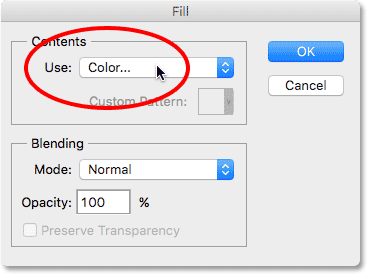 Click OK to close out of the Color Picker, then click OK to close out of the Fill dialog box. The document after re-drawing the same square shape. 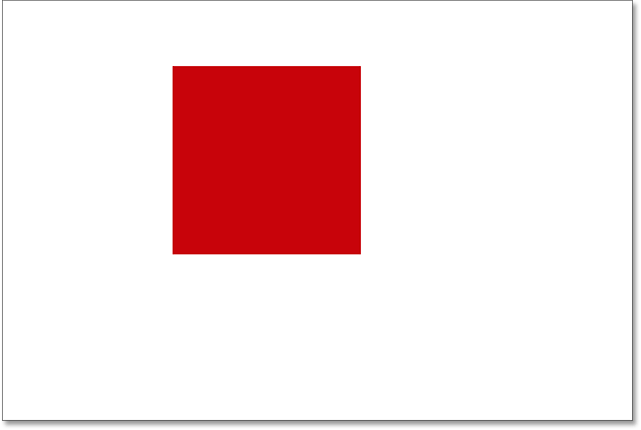 The square shape and the white background are now independent of each other. The new blank layer appears above Layer 1. Notice also that Layer 2 is highlighted in blue, which means it's now the active layer. Anything we add next to the document will be added to Layer 2. Grab the Elliptical Marquee Tool from the Tools panel (nested behind the Rectangular Marquee Tool) and drag out a circular selection, just as we did before. Make sure that part of it is overlapping the square. Then go back up to the Edit menu and choose Fill. 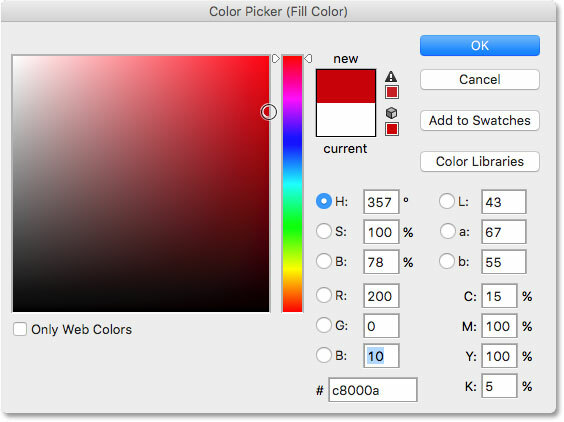 Re-select Color for the Use option to open the Color Picker and choose a color for the shape. I'll choose the same orange. Both shapes have been redrawn. Each element in the document is now on its own layer. Previously, when everything was on a single layer, we found that there was no way to move the square shape in front of the round one because they really were not two separate shapes. They were simply areas of different-colored pixels mixed in with areas of white pixels on the same flat image. But this time, with everything on its own layer, we really do have two separate shapes, along with a completely separate background. Let's see how we can use our layers to easily swap the order of the shapes. 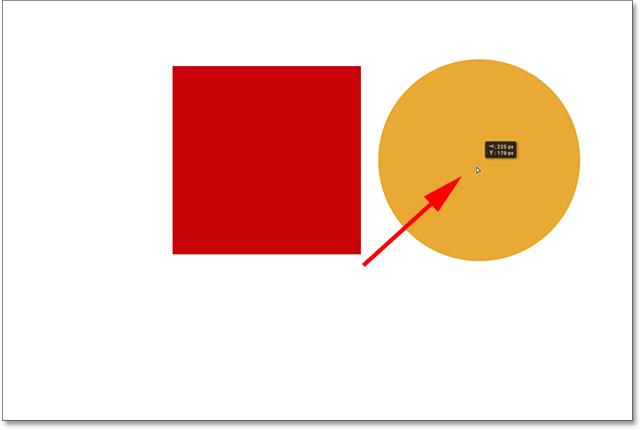 At the moment, the round shape appears in front of the square shape in the composition because the round shape's layer (Layer 2) is above the square shape's layer (Layer 1) in the Layers panel. Imagine as you're looking at the layers from top to bottom in the Layers panel that you're looking down through the layers in the document. Any layer above another layer in the Layers panel appears in front of it in the document. 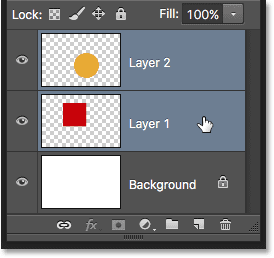 If the contents of two layers overlap each other, as our shapes are doing, then whichever layer is below the other in the Layers panel will appear behind the other layer in the composition. Dragging Layer 1 above Layer 2. 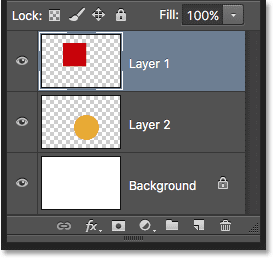 Layer 1 now appears above Layer 2 in the Layers panel. Thanks to layers, it was easy to move one shape in front of the other. Without layers, moving one element in front of the other like this would not have been possible. But with everything on its own layer, it couldn't have been easier. Layers keep everything separate, allowing us to make changes to individual elements without affecting the entire composition. What if I decide later on that, you know what? I actually liked it better before. I want to move the round shape so it's back in front of the square one. Thanks to layers, it's not a problem! Just as we can drag layers above other layers, we can also drag them below other layers. Dragging Layer 1 below Layer 2. 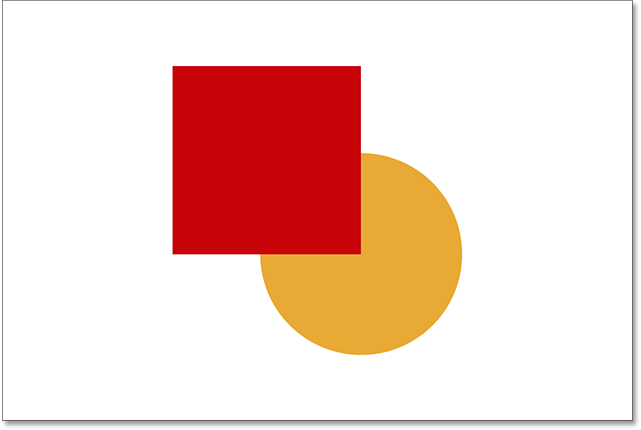 The square shape's layer is back below the round shape's layer. The shapes are back to their original order. What if we don't really want the shapes overlapping each other? Maybe they would look better if they were spread further apart. Again, because they're on separate layers, we can easily move them around. 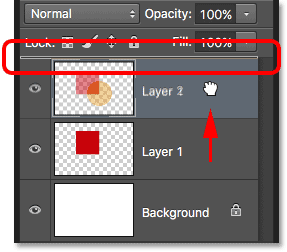 Clicking on Layer 2 to select it. Layers make it easy to move elements around within a composition. Moving both shapes at the same time. Dragging Layer 1 into the trash. Deleting a layer removes its contents from the document. Dragging Layer 2 into the trash. Both shapes have been removed. Only the background remains. And there we have it! We've barely scratched the surface here when it comes to all of the things we can do with layers, but hopefully you now have a better sense of what layers are and why they're such an essential part of working with Photoshop. Layers allow us to keep all of the various elements in a composition separate so we can add them, move them, edit them, and even delete them without affecting anything else. And because layers keep our workflow flexible, they offer us a level of creativity that simply wouldn't be possible without layers. 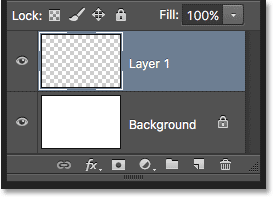 As I mentioned earlier, anything that has anything to do with layers in Photoshop is done from the Layers panel. So now that we have a basic understanding of what layers are and how they work, lets jump into to the next tutorial in our Layers Learning Guide and learn everything we need to know about the Layers panel! Or, view our Photoshop Basics section for more tutorials!